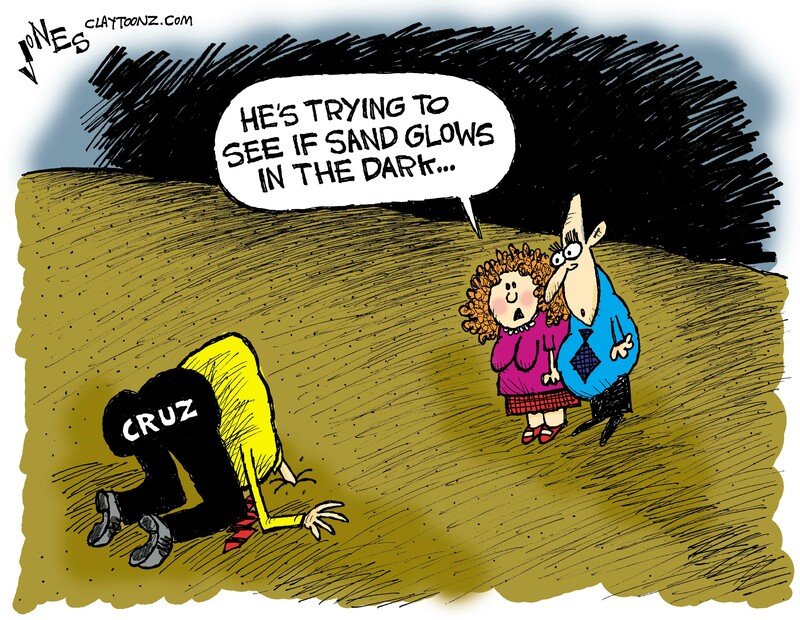 Ted Cruz says if he’s elected president, he’ll carpet bomb ISIS until sand glows in the dark. I know Senator Cruz loves portraits of himself, but does he own carpet? Does he know how it works? He says he’ll avoid bombing cities with his carpet bombing as he’ll only bomb where ISIS is located. If he can take his own head out of the sand (or a certain part of his anatomy) then maybe he’ll realize ISIS is in Mosul, Ramadi, Raqqa, Fallujah, and Hawija. Those, Senator Cruz, are cities. Donald Trump promises he’ll “bomb the bleep out of them” and plans to put hits on terrorists’ families. Marco Rubio wants to insert ground troops. Chris Christie says we’re in World War III, and in case war with ISIS doesn’t bring Armageddon fast enough, he’ll take pot shots at Russian planes. Lindsey Graham says he misses George W. Bush and wishes he was still president. On top of all that they’re waging a campaign that we’re at war with Islam. This is the kind of stuff that’s music to the ears of ISIS and they use it to recruit new fighters. The funny and scary thing is all of these candidates’ solutions to destroy ISIS are the very things that created ISIS. These candidates claim they want to defeat ISIS. Maybe they’ll actually help with that after providing recruiting material for future ISIS newsletters. In many ways, editorial cartooning is an art in disrespect. I like that. There’s plenty of people out there begging for it. Pundits today said presidents should never be snarky. 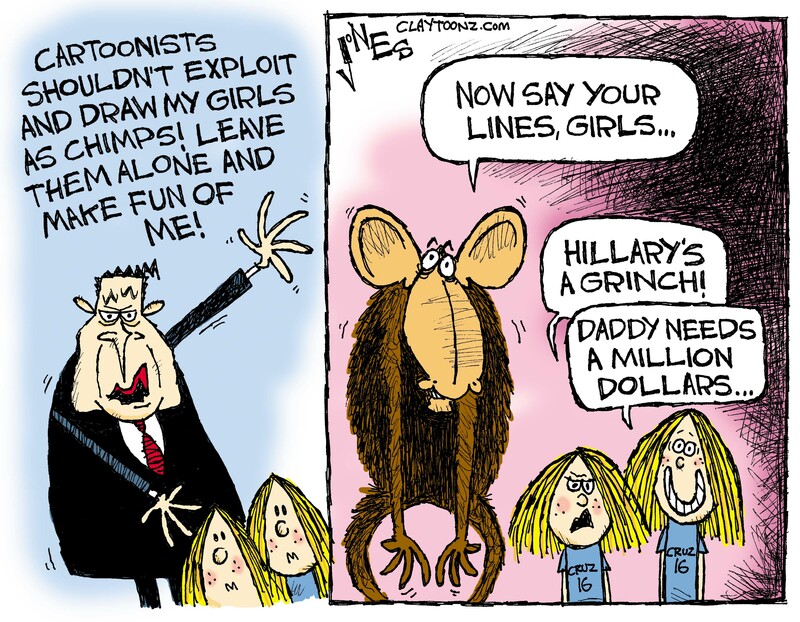 Thankfully, they weren’t talking about political cartoonists. Obama is overseas right now but the job goes where the president goes and he criticized the right wing rhetoric freaking out over refugees. He mentioned how in addition to being afraid of debate moderators, now Republicans are afraid of widows and orphans. You don’t really man up by whining about the president insulting you. Well that’s exactly what United States Senator Ted Cruz did. He cried like a baby, or like someone stole his copy of Mein Kampf. 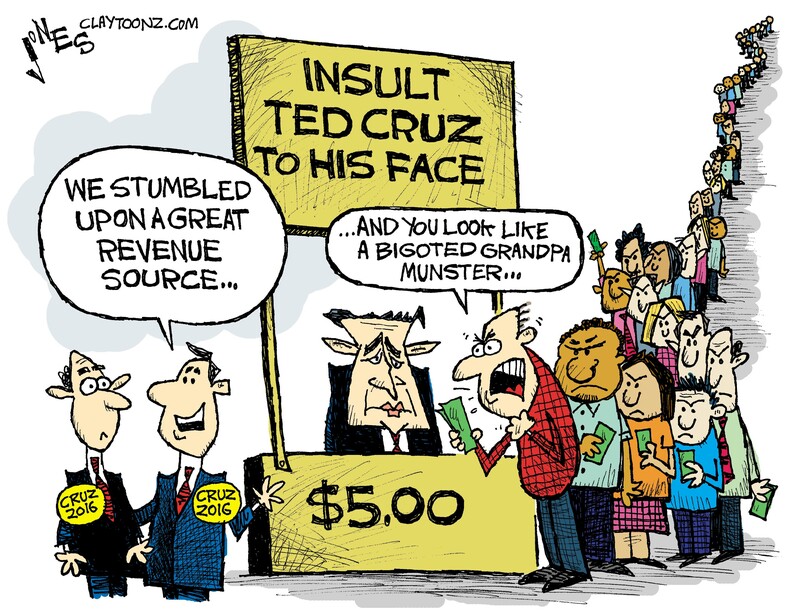 School yard bully Ted Cruz responded that it’s OK for the president to insult him, but he needs to do it to his face. Yeah, it’s kinda hard to look tough and manly after screaming you’re scared of widows, orphans, liberal debate moderators, sun light, garlic, mirrors, stakes through the heart, etc. That ship has sailed. He challenged the president to a debate and said it can be held anywhere preferably on U.S. soil, and in a mausoleum where you can keep your blood cold, as that’s where the senator is most comfortable. Two things about Ted Cruz you should keep in mind when he talks: 1. He’s an idiot. 2. anything he or anyone says while running for president is pandering to their base. Ted Cruz’s base is one of racists. 3. He’s really creepy. OK. Three things to keep in mind. Ted, the president isn’t going to debate you. That would be just the boost your campaign needs. It would legitimize you and despite being a United States senator, you’re not legitimate. Your views are regressive and opposite of the direction the country is going in. Also, the president didn’t call you out by name. He saw Beetlejuice. The president is justified to criticize these freaks while he’s out of the country. America’s right wing is embarrassing us to the world so why not insult them before an international audience? President Obama was in The Philippines when he made his comments, not Turkey as Cruz stated. This guy is almost as bad with maps and geography as Ben Carson. But lucky for Cruz, his father was better with maps when he left Cuba and found the U.S. (after finding Canada) where he sought political asylum. I guess that irony ship has sailed too. Do you feel insulted when someone calls you out for your bigotry, racism, xenophobia, Islamophobia, sexism, and just downright being a horrible, disgusting, and vulgar waste of humanity? Then maybe you should stop. Stop creating legislation banning Syrians. Stop saying we should only accept Christians. Stop suggesting we should round up all refugees. Don’t kick them out of your state like the governor of Indiana did today (they were redirected from Indiana to Connecticut, where the governor is not a troglodyte, which is kind of a win for them). Don’t threaten to shut down mosques as Donald Trump suggested. Do not use the internment of Japanese civilians in World War II as a great and positive example, as the mayor of Roanoke, VA (my state) did today. Don’t use human suffering as a campaign prop, as the prostitute-loving senator from Louisiana is doing. Don’t say the president hates America because he’s black like Ben Stein did today (giving Ferris Beuller another reason to skip that class, Racism 101). You know what? Just stop saying the president doesn’t love America. George W. Bush brought this country to its knees, not because he hates it. He did it because he’s a moron who wanted to make war profiteers even richer. Despite everything France has been through this past week, their president has vowed to take in more refugees. There are still good people out there, despite all the racists on Facebook giving the impression otherwise. Sometimes the truth hurts. Senator Cruz, you’re xenophobic. And yes, You do look like a bigoted Grandpa Munster.